Skiing/Snowboarding in resort country is a fantastic way to escape the winter blahs and feel the rush of setting off down hill through groomed trails and fresh powder. Being a fairly new snowboarder, I have certainly been excited with the early and massive accumulations of fresh snow this winter at the different Ontario ski resorts. Depending on the area you are looking to travel to there are many options to get out and try this activity. For central Ontario, Blue Mountain Resort near Collingwood is an excellent choice for those looking to get that Ski Village feel offered out west. The village offers a variety of restaurants and nightlife opportunities to keep your energy pumping long after you have left the hills for the day. The resort offers an outdoor heated pool which is always fun on a winter's day. Horseshoe Resort outside of Barrie and Orillia has been working hard at updating their Terrain Park and is a great place with options of staying at Horseshoe or Carriage Ridge Resort. Further down the road is Mount. St. Louis Moonstone which is just a quick drive from Christie’s Mill Inn and Spa and Muskey’s Landing. In the Haliburton Region Sir Sam’s Skiing offers 12 trails of great fun and with Sir Sam’s Inn and WaterSpa located near the base of the hill, you can stay in comfort and give your muscles some much-needed relaxation through hydro therapy. Also nearby is Pinestone Resort, Sandy Lane Resort, Bonnie View Inn and Halimar Resort all offering their own comfortable accommodations and winter fun activities. 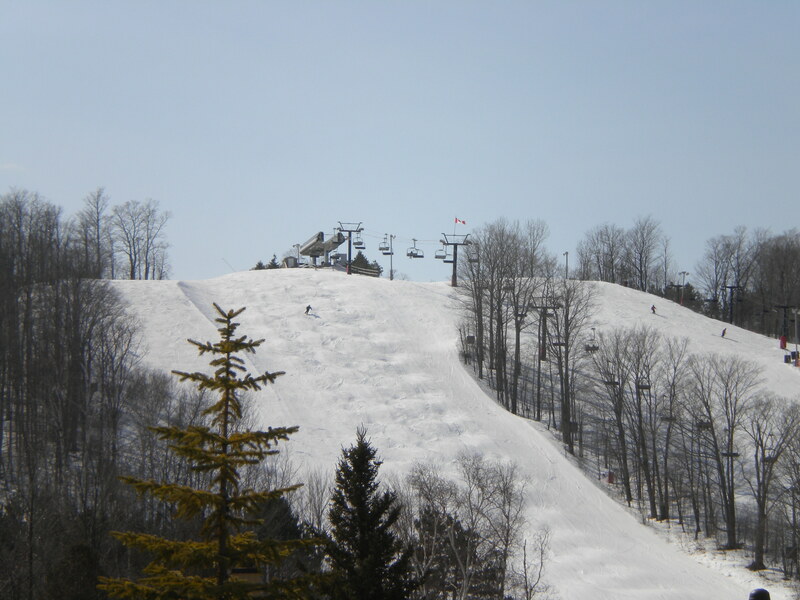 For those visiting the Ottawa area Calabogie Peaks Resort offers the convenience of 23 runs at the resort. For those looking to take in the Capital, you can also book ski packages through Brookstreet Hotel and have the best of skiing and history while staying at a great hotel. Muskoka is often thought of as a summer destination for the pristine lakes but those that have visited the area in winter know that Hidden Valley Highlands Ski Area is a great place to get out an enjoy some downhill fun. With it’s longest run being 580 meters (1902 ft.) there is a great opportunity to explore and have fun on the slopes for a day. There are many resorts to stay at in Muskoka that are just a short drive to the ski hill including Deerhurst Resort, Beauview Cottages, Cedar Grove Lodge, Bondi Cottage Resort plus many others. If you are in the Greater Toronto Area and don’t want to venture far, Hockley Valley Resort is just a quick 45 minute drive north. With 15 runs, both an upper and lower level terrain park and state of the art snow making, there is a long season ahead for those looking to take advantage of the convenience Hockley Valley offers. Regardless of which part of Ontario you are looking to visit, skiing and snowboarding gives you a great way to get out and experience an adrenaline packed sport that is fun for first timers and lifetime skiers. While you might be intimidated to try this out, each of the ski areas mentioned offers lessons to help you get the hang of it, which at the end of the day makes the hills that much more enjoyable. Come on up to our place for great skiing.